Listen to the performance text I recorded at Knepp Wildland Project, written and performed with Jamie Lorimer, Sofie Narbed, Jenny Swingler and Scott Twynholm. The Six Wild Ways of the Oak is a creative response to the wild ways of the site, focussing on the different topologies through which we might conceive of the oak. My new article, co-written with Jamie Lorimer, has just been published. Read it in GeoHumanities. My production of Eulogy by Rob Drummond – the sequel to 2011’s Top Table – will be on 16th-21st April (Òran Mór, Glasgow) and 24th-28th April (Traverse Theatre, Edinburgh). The latest episode focusses on The Majority by Rob Drummond, which I directed in August 2017. Includes interviews with me and Rob, along with researchers Oliver Heath (RHUL) and Kirsty Sedgman (Bristol). A script for my devised performance, Demises (2007), was published this summer by Oberon in a new book of texts from the first ten years of the Forest Fringe. Purchase a copy here. A new book about Deep Mapping includes the article I wrote with Dr. Laura Bissell, ‘Regular Routes: Deep Mapping a Performative Counterpractice for the Daily Commute’. Download the PDF version, or purchase a copy here. 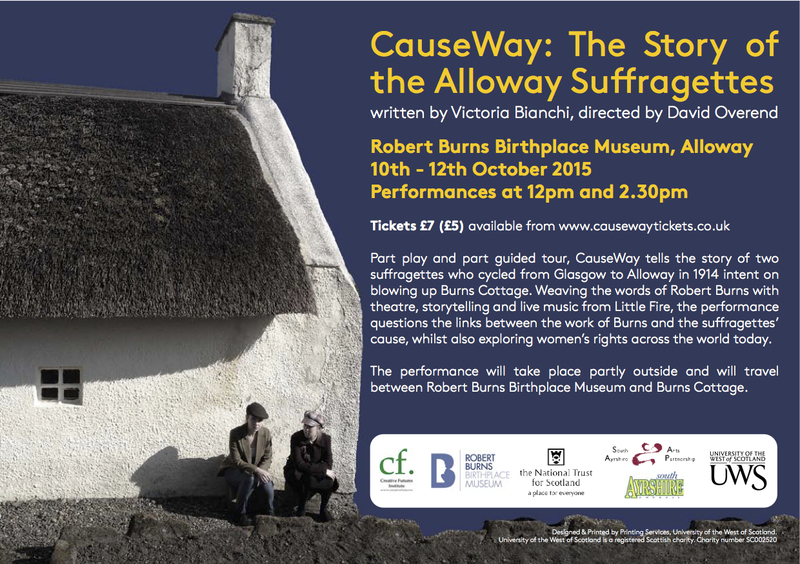 CauseWay by Victoria Bianchi, a site-specific performance I directed for the National Trust for Scotland last year, will be presented again at the Robert Burns Birthplace Museum in Alloway, on 10-12 October 2015. Buy tickets here. My new article, co-written with Dr. Laura Bissell, has just been published. Read it in Humanities.